I am always pleased to answer general queries and questions about my work. I enjoy sharing my knowledge and enthusiasm for traditional craftsmanship with like-minded individuals or equally the casually curious. I can only cover some of my areas of interest here because of space, so if you think of something else you need help with, please contact me and I can see what I can do. I am an experienced after-dinner speaker and demonstrator, my talks are designed to inspire. I regularly attend local (and increasingly more far flung destinations!!) venues and have also undertaken successful workshops in writing, art, colour and textiles (or varying combinations of them as required). There is nothing I enjoy more than unravelling the mystique which has grown up around the subjects, and rendering them accessible and affordable to take up either as a hobby or professionally. This was the thinking behind the SpinDyeWeavers project, a workshop group facilitating ideas, energy and inspiration of like-minded craftspeople, which I started in 2009. For writers I have also run a number of groups including the Great Western Writers which was based at the Bristol Central Library, Cedar Writers a local writing group in Knowle, along with Writing in the Margins (a virtual writing cafe). These were designed to facilitate, encourage and support writers at any entry level, with a number going on to achieve critical success. I am experienced in facilitating educational projects and able to undertake hands-on classroom/teacher demonstrations (I hold Enhanced CRB certification). I have personal experience of disabled people, and design projects which facilitate and enable what can be achieved, encouraging self-discovery and building confidence. Another area in which I have extensive experience is in stage, media and film production. My specialism is in areas such as dialogue/script coaching and skills demonstrations, along with set-dressing. I am able to offer concise, flexible (and invisible !!) 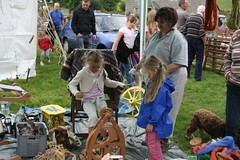 tuition to enable accurate and convincing portrayals of spinning, weaving and other associated crafts. For commissions, more detailed discussions and general advice I am available on an affordable consultancy basis. So, if you have a project in mind, don't know where to start or even just casually interested and would like to ask more... please submit the form below with your details, daytime telephone number and a brief outline of your thoughts. You are under no obligation, and sometimes it is easier to develop a project more successfully if it is brainstormed and the possibilities explored at an early stage. You can contact me directly at shani@dyeverse.org or complete the contact form, and I shall get back to you as soon as possible. I am though currently on sick leave, so if I am unable to assist, I am happy to forward your details to a contact if you would like.